Forced From Home is a free, interactive exhibition presented by Doctors Without Borders/Médecins Sans Frontières (MSF) designed to convey some of the challenges confronting a person forced to flee. 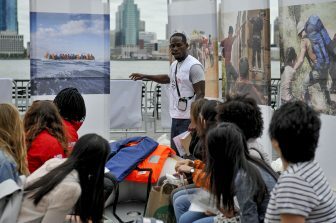 Visitors engage with stories and materials gathered from refugee camps, sea rescue missions and emergency medical projects. Throughout the tour, visitors hear from Doctors Without Borders aid workers who provide humanitarian relief on the front lines of the refugee crisis. The immersive experience includes virtual reality and 360° videos that transport participants to refugee communities and camps where they hear from refugees from Syria, Myanmar, Afghanistan, Burundi, Honduras, South Sudan, and more. The exhibition provides a unique educational experience for adults and children ages 12 and older. Visitors gain a deeper understanding of the global refugee crisis, the dangerous journey made by those who have been forced from home and the humanitarian assistance offered by Doctors Without Borders. For more information, visit www.forcedfromhome.com.